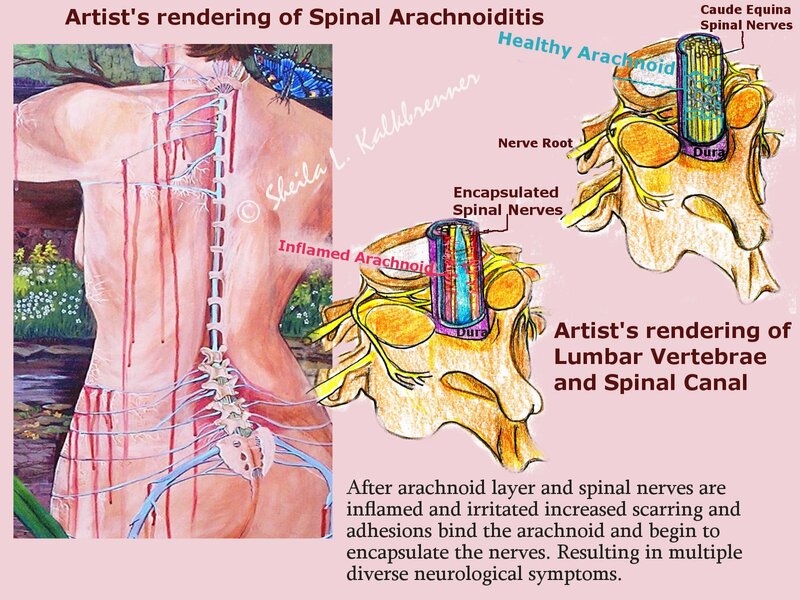 Arachnoiditis is a spinal cord injury resulting from inflammation in the arachnoid layer of the spinal canal which results in the clumping or sticking of nerve roots inside the spinal fluid. The nerves adhere together resulting in multiple diverse neurological consequences. “Spinal arachnoiditis is a rare disease caused by fibrosis and adhesion of the arachnoid membrane due to chronic inflammation. The causes of arachnoiditis are infection, spinal surgery, intraspinal injection of steroid or myelography dye, and spinal anesthesia…Symptoms of spinal arachnoiditis occurred 6 months after a single caudal block in (A 60-year-old woman who had received a single caudal block 6 months before symptom onset. )…Clinicians should be aware of this possible delayed complication.” ~Delayed occurrence of spinal arachnoiditis following a caudal block J Spinal Cord Med. 2011 Nov; 34(6): 616–619 Full Article at The Journal of Spinal Cord Medicine. SYMPTOMS INCLUDE (but are not limited to) Intractable pain, muscle weakness, difficulty swallowing, Sleep deprivation, Muscle wasting,Joint stiffness,Reduced activity/immobility, distortions of body size perception (similar to those felt in the lips/face after dental anesthetic), tingling and numbness, loss of sense of limb position, dizziness, loss of balance, Tingling, numbness, or weakness in the legs or arms, sometimes accompanied by restrictive neck pain, Profuse sweating, Bizarre sensations such as insects crawling on the skin or water trickling down the leg, Severe shooting pain (which some liken to an electric shock sensation), Positional, often severe, headaches as a result of obstruction to the flow & rotation of cerebrospinal fluid (CSF), vomiting,Muscle cramps, spasms, and uncontrollable twitching, Loss of coordination (ataxia), Bladder, bowel, and/or sexual dysfunction, Extreme sensitivity to climate and temperature changes, and/or to noise and/or to bright light, blurred vision, buzzing/ringing/whistling/hissing/pulsing in the ears with possible heightened sensitivity to external sounds (hyperacusis) ~ the combination and extent of the symptoms varies related to spinal region involved. Patient Self-Help at Veract Intractable Pain Clinic “They are presented here as a public service. I hope you find something to help in these guidelines for Intractable Pain Patients.”~Forest Tennant M.D., Dr. P.H. Mrs. Walsh, I am sorry to hear that your daughter has spinal arachnoiditis. I am an arachnoiditis survivor, too. I started this project to share art and the ways that it has helped me learn to live with this terrible medical injury. This informational page is not meant to be a comprehensive description of this complicated spinal cord injury. It is simply meant as a window into our world and a first step into other resources as they become available. Dr. Aldrete is very knowledgeable about arachnoiditis. However, he is not affiliated with this website for the Art For Arachnoiditis Project. I think you can still reach him through the contact information at the Arachnoiditis Foundation link: http://arachnoiditis.com/ The Art For Arachnoiditis project is a charitable project of SheilaLynnK Art Studio fiscally sponsored by the New York Foundation for the Arts to Empower Spinal Arachnoiditis Survivors via participation in the arts. Many more details about the project are available on this website and the Art For Arachnoiditis tab at http://sheilalynnkart.com/home.html. ~Wishing you and your daughter a low pain day. Hello Brent, Welcome to the Art For Arachnoiditis Project. I am not qualified to offer medical or legal advice but, I will leave your request here for others who may be qualified to do so. I hope that you find the assistance that you need. As I tell most people who visit the project, I am so sorry that you need us but, glad that you found us. ~Wishing you a low pain day blessed with passion-worthy inspirational moments.